Caves, temples, and camping under the stars – a trip to Gandikota (often regarded as The Grand Canyon of India) is something every adventurist must take. Located at seven and a half hours away from Hyderabad, Gandikota will wrap you in its majestic beauty. So what if you haven’t been to the Grand Canyon yet, this one will give you a similar experience! Situated in Jammalamadugu of Kadapa District, Andhra Pradesh, this fort was developed in 1123. Attracting adrenaline junkies since ages, people take a road trip from Hyderabad on weekends to discover several hidden gems en route. It’s also a famous getaway for bikers who cherish dashing through the wild jungle near Kadapa. The rock formations over Pennar River, Gandikota, will remind you of Arizona’s Colorado River. 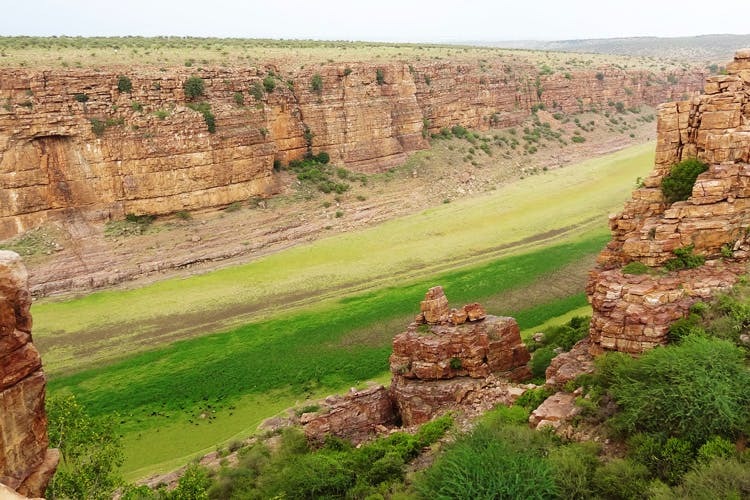 While the drive to Gandikota will fill you in with thrilling cuts and bends along with dry forest belts, witnessing the sunrise or the sunset over Gandikota will be a tear-jerking moment for anyone. Reach the fort by evening, and prepare for a night camping. Scout for the best place from where you can witness the stars and the Moon, and set your camp. You and your squad can kickstart a serious BBQ party with some music for company. Over conversations and lip-smacking grills, you’re sure to have a time of your life. The next day, you can set off to visit Belum Caves and Ahobilam Temple. With a good pair of sneakers and lots of hydration, we can assure you it’s going to be a thrill ride. Belum Caves is tens of thousands of years old and is known for its natural stalactites and stalagmites. It is said to have deposits of quartz and black limestone in the caves which can be explored on your visit. It might take a good two to three hours for you to wander away in these caves, depending upon how much you’re interested in exploring. Your next stopover could be at Ahobilam Temple. Located in the Eastern Ghats, this 11th-century temple will also give you a good view of Nallamalla. With natural rock formations and greenery, this temple is a must-visit if you’re at Gandikota. You can take a train/bus to Jammalamadugu or you can reach there by car. Also, you can book your stay in Haritha Hotel at Gandikota.